The nation’s GDP grew by an 11-year record 7.08 percent, double the inflation rate, while trade surplus topped 7.2 billion USD, the highest ever figure. Disbursement of foreign direct investment (FDI) also reached a record 19.1 percent. Inflation was kept under 4 percent for the third consecutive year. “We have been able to achieve growth in most fields in the context of complicated international situation, particularly maintaining macro-economic stability and a high growth rate, thus winning the confidence for nearly 100 million people,” Prime Minister Nguyen Xuan Phuc said about the efforts of the entire political system, localities, the business community and people nationwide. The world economic situation saw many unfavourable developments in 2018, including the rising trend of trade protection, the US-China trade war, rising interest rates, and complex fluctuation of oil prices. In the country, many outstanding problems remained unsolved, such as limited productivity, slow disbursement of investment capital despite improvements, and lower-than-expected economic restructuring, which hindered the growth pace. In such circumstances, the good economic indicators demonstrated the success of the Government’s governance and the great efforts of the business community and the people. The highlights in the Government’s management in 2018 were the Resolutions 19/NQ-CP and 35/NQ-CP on improving the business environment and facilitating enterprises’ development, along with Resolution 139/NQ-CP on a plan of actions to cut costs for enterprises. The effects of the Government’s actions can be seen in the number of new businesses established during the year – 131,275 new enterprises, up nearly 5,000 from 2017. Improvements in Vietnam’s business and investment environment during the year were recognised by the international community. The World Economic Forum, in its Global Competitiveness Report 2018, ranked Vietnam 77th among 140 economies. Vietnam also made great efforts to perfect institutions, mechanisms and policies towards meeting international practices. According to Finance Minister Dinh Tien Dung, the country has carried out its commitments on import-export tariffs and opening of the financial service market in line with international agreements to which it is a member. Such moves have helped Vietnam attract FDI and boost foreign trade. As of the end of 2018, the country has 27,353 valid FDI projects from 130 countries and territories with a total 340 billion USD in register capital. The FDI sector accounts for a quarter of total social investment and more than 70 percent of export value, creating 8.5 million jobs. Meanwhile, foreign trade revenue in 2018 totalled 482.2 billion USD, also a record figure. The economic restructuring has resulted in less dependence on the exploitation of minerals and natural resources as well as credit. According to the Finance Ministry, the contribution of crude oil to the State budget has decreased continuously, from an average 30 percent during 2006-2020 to 4 percent this year, and is estimated at 3.2 percent in 2019. Meanwhile, credit growth was at 13 percent this year to December 14, lower than the level in 2017. Think tanks and experts said Vietnam faces several risks and challenges in 2019. They pointed to the pressure created by the USD exchange rate and the world prices, the tension from the prolong trade friction among big economies, rising trade protectionism. The enforcement of international trade deals to which Vietnam is a member brings not only opportunities but also big competition for domestic production and business. As 2019 is the key year for the success of the 2016-2020 socio-economic development plan, experts said the country needs to seek more driving forces for economic growth, first of all in the new stage of international integration. Next year Vietnam will complete the roadmap for its commitments as a member of the World Trade Organisation and the ASEAN Trade in Goods Agreement, and will begin to perform its promises under several major free trade deals including the Comprehensive and Progressive Agreement for Trans-Pacific Partnership (CPTPP) and the Vietnam-European Union Free Trade Agreement with deep and comprehensive commitments. Those FTAs are hoped to create a driving force for the Vietnamese economy through the high openness of the economy and more opportunities for FDI attraction. The strong development of the private economic sector will also help drive the domestic economy forward. In addition, the restructuring inside each economic sector is expected to boost economic growth both in speed and quality, according to Director General of the General Statistics Office Nguyen Bich Lam. He cited as example the shift from low-value crops and animals to those of higher value in the agricultural sector, or the shift to industries making products with high added value and export value. At a year-end working session, the Prime Minister’s advisory team noted that the economy has great potential while many new opportunities are expected to come next year. They said the growth pace can be maintained in the next two years if the country can take effective measures to optimize opportunities and better tap the economy’s potential. The team presented three scenarios for the economy during 2018-2020, under which the economy would grow at an average 6.86 percent a year (scenario 1), 6.91 percent (scenario 2) and 7.06 percent (scenario 3). The team also recommended striving for a growth rate of 6.9 – 7 percent and an inflation rate of under 4 percent in 2019. 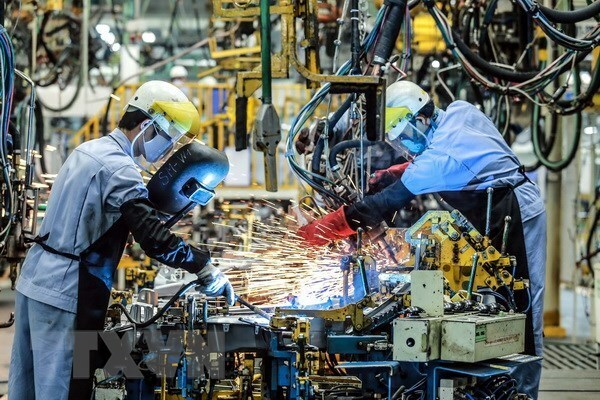 In order to realise these targets, the advisory team said the manufacturing-processing industry and services must be made the main drivers of the economy and must achieve a higher growth than in 2018. Stronger measures are also needed to promote the private sector. The team proposed that the Government focused its leadership on removing the four key bottlenecks, which are those in implementing large-scale projects, developing the private economic sector, firms’ investment in agriculture and better tapping social resources.